Upcoming Friday both record compays join forces for a bash with the best they got to offer. For Pampa Records turntable wizard DJ Koze plays one of his thrilling unpredictable sets. Also the Swedish House funster Axel Boman spins four-to-the-floor rhythms and the crazy north German duo Die Vögel melts roaring trombones with techno rhythms live. The most fascinating thing will be the live performance of Ada who presents exclusively her heartfelt brand-new Folk meets Electronic longplayer Meine zarten Pfoten. For the Innervisions camp Dixon plays one of his deeply moving House sets. Also his buddies Âme will be around. But not only to spin records, also to play a rare live show. To complete the madness the Jazz and Soul specialist Henrik Schwarz performs one of his deeply grooving live sets. The doors to this top-notch event at Mirabe, a secluded cosy outdoor venue overlooking the city of Barcelona, open at 15:00 pm, and the whole action runs straight until 3:00 am, with moving from outside to inside around 20:00 pm. 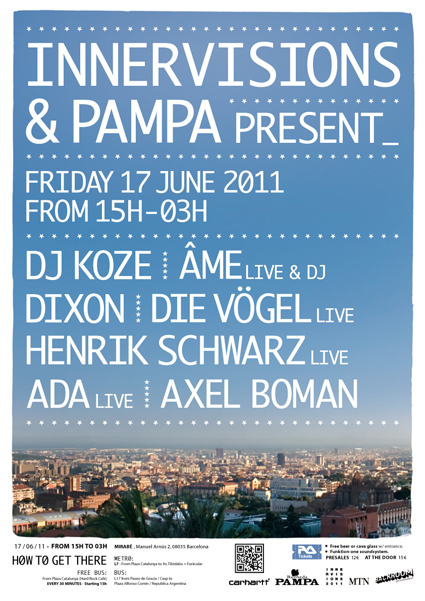 Anyone keen to attend can catch a free bus shuttle out to the venue that runs every 30 minutes from Plaça de Catalunya.